I was given a book this week by one of our Pastor’s and it’s been very helpful in giving me some inspiration to write. Very timely! 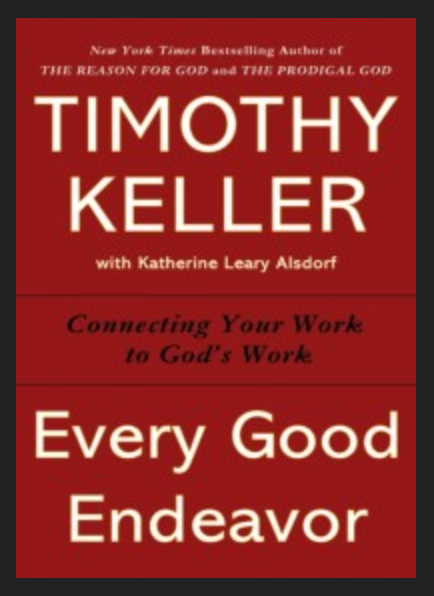 It’s by Timothy Keller and the title is ‘Every Good Endeavor’ – connecting your work to God’s work. I’d never really thought about God creating the world as Him working. I have an image of God just sitting there effortlessly creating the world. Of course, I haven’t a clue how He created it but, for sure, He was working. And He was enjoying working. So much that at the end of each day, He said that ‘It was good’. Do we do that? I don’t think I do. I think I’m just relieved to get on the train and leave it all behind….in tatters. But our work should be a continuation of God’s work. How do we know that? Because He allowed us to do things that He could easily have done. He let us name all the animals. He named the stars and could have easily names the animals as well. He gave us the raw materials to make textiles and building materials. He could have done everything we have achieved but He let us do the work. So, why aren’t we as joyful in doing work as He was? I think it’s because we see it as a chore. We don’t connect God’s work to ours. But whatever we do for a living, we are continuing God’s work. Let’s think about what we do and try to connect it back to God. How is our work beneficial or useful to others beyond what it does for us? (Money, self-esteem etc). Once we answer the question we start to see how it is a continuation of God’s work. It doesn’t have to change what we do but it may change how we go about doing it or what we believe the result of our work is, remembering that God can finish things that we start. We may even start to realize that it’s not at all pointless and that indeed, some of it ‘is good’! This post, courtesy of Mr Keller! Heavenly Father, help us to understand what our work is all about and make some sense of its role in our lives. Help us to fulfill and carry on your good work in a way that is joyful, unselfish and of benefit to others – Amen! This entry was posted in Discipline, Glorify, Praise, Relationship, serving and tagged Christian books, Christianity, Endeavor, God, God the Father, God's creation, Heavenly Father, Religion & Spirituality, Timothy J. Keller, Timothy Keller, work by CommutewithChrist. Bookmark the permalink.